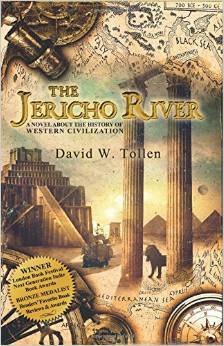 Tollen, David W. “The Jericho River: A Novel About the History of Western Civilization”, Winifred Press, 2014. Sumer, Babylonia, ancient Greece, Medieval Europe, Napoleon’ empire, and others and does so chronologically through Western civilization. Jason’s father is a historian and it is his notes that outline history and it is through them that we learn of the truth about Cleopatra, King Arthur, and the fall of the Roman Empire. He explains “that Snow White began as a goddess and why Eve was created from Adam’s rib, as well as the origins of coffee, the cat, chivalry, the Internet, Atlantis and much more”. Here is history that is written in a way that we have never read before. At the back of the book are maps of Europe, North Africa, and southwestern Asia, which help to show where some of the events took place as well as timeline of the important events in history. It attempts to whet the reader’s desire to learn history through a tale that is part adventure, part fantasy, and part science fiction, with a bit of romance thrown in. The protagonist, Jason Gallo, is transported to another world in an attempt to find and rescue his father, who is also stuck in that world. In this quest, he travels along The Jericho River, which turns out to be a river that passes through time. Each stage of his journey takes him through a different civilization and a different period of Western history, from the time of the Sumerians to the early twenty-first century. Along the way he meets “lumins” (creatures that are part human and part other species, and which have telepathic powers), pirates, barbarians, medieval warlords, and Enlightenment philosophers, among others. Woven into the book are extended “footnotes” from the writings of his father, an academic historian, presenting various factoids of the civilizations through which Jason is traveling. The book was written to create an interest in history and in a way that the reader will want to learn more. I was soon wrapped up in Jason’s story and with the way the historical facts were presented. This historical fantasy follows Jason Gallo on a quest to find and rescue his father. With the aid of a mysterious woman, writer David W. Tollen creates interest almost immediately. Jason finds himself stranded in ancient Sumer and he must flee down the only path open to him, the Jericho River, along with a catlike creature called a Lumin. The characters are interesting from the get-go and the way the journey works is that each stop along the Jericho River becomes a short history lesson. We also have input from Jason’s historian father who acts as a speaker for the stories. The adventure and the quest are so well done that we forget that this is a history lesson. The book also features twenty-six vivid historical illustrations and three maps. This is a light, easy way to learn lots of history and we do so by playing a game. “The Jericho River” has won multiple awards, including first place at the London Book Festival and the Next Generation Indie Book Awards, as well as a bronze medal at the Reader¹s Favorite Book Reviews and Awards Contest. This entry was posted in Uncategorized on October 22, 2015 by Amos.